Worldwide, stories are told of animals that become people and of people that become animals. In Europe and the United States, the best known of these stories is that of the creature called the werewolf. Many think that werewolves are people who become half-human and half- wolf on nights of the full moon, that being bitten by a werewolf can turn a normal person into a werewolf, and that werewolves can only be killed by objects made of silver; but all three of these “facts” were invented by American monster movies. Real werewolves, the type that people believed in over a hundred years ago, were humans who could purposely turn themselves completely into wolves, and so disguise their identities as they committed terrible crimes. How did people become wolves? In all cases another type of monster was involved; a person known as a witch, who had made a deal with an evil spirit that gave them special powers with which to hurt other people. Sometimes the witches themselves became wolves, other times the witch caused innocent people to become wolves. In both cases, the results were the same; an unusually intelligent wolf or wolves mainly concerned with murdering people. Werewolves were essentially like normal wolves, only smarter; so they could be hurt and killed in the same way a normal wolf could be... if you saw them coming. The spell to become a wolf usually required a wolf’s skin; most often, the would-be werewolf needed to wear the skin, becoming a wolf as they slid the skin on. 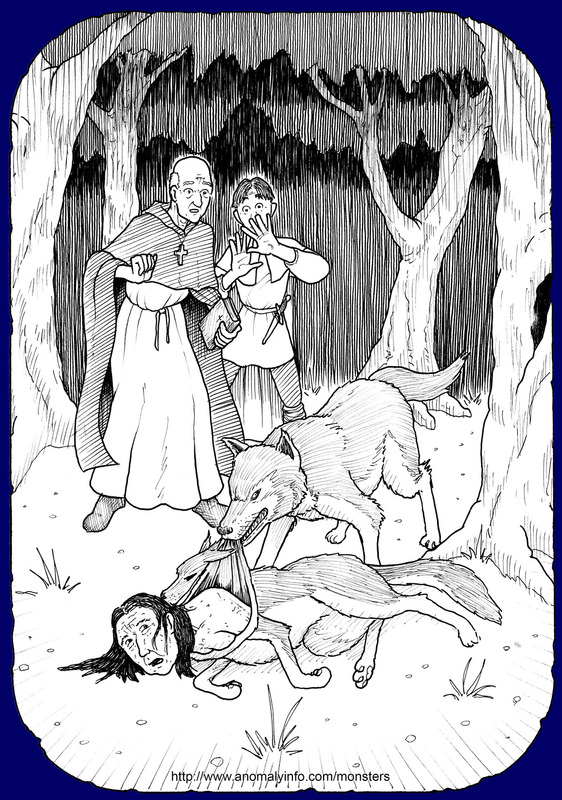 Around 1186 in Ireland, a priest and a young man traveling from Ulster to Meath were approached one night in a forest by a wolf. The wolf asked if the priest would perform last rites for its wife, as she was dying. The priest went to and comforted the she-wolf, but felt he could not perform last rites since she was not human. The wolf stated that it would be okay, for the two of them were actually humans whose family carried a curse; and with that, the wolf pulled at his wife’s fur until the wolf skin peeled back enough to reveal an elderly human woman inside. Satisfied with this answer, the priest performed the last rites for the female werewolf. Not all werewolves needed to wear a wolf skin. It is told that around 1821 in Poland a witch hid an enchanted wolf skin under the doorstep at a wedding to transform everyone who walked out the door into wolves. These werewolves ― which included the bride and groom ― served the witch for three years, after which she released them. By wrapping a wolf skin around each werewolf, she returned them to human form... but she accidentally left the wolf tail on the groom, who had it for the rest of his life! Another way to become a werewolf was to use a magic ointment rubbed on the skin. Many scientists now believe that poisons used in these “magic” ointments confused people and caused them to simply think they were becoming wolves. However, in Germany around the year 1600 CE, one woman made a strange demonstration of her ointment’s power before a court of law that seemed to indicate that something more than self-illusion was involved. Told she needed to demonstrate how her ointment worked, she rubbed it on her skin and passed out for three hours, all the time being watched by members of the court. When she awoke, she claimed to have become a wolf and to have killed a cow and a sheep. Court bailiffs sent to investigate the place she designated found the dead animals right where she said they would be! One more interesting note: werewolves were one of the earliest monsters to be featured in a movie. In 1913, a movie called The Werewolf told the story of an indian maiden who used magic to become a wolf and kill the white settlers invading the land of the Americas; and 100 years after her death, she rises from the grave to kill again! I'd love to see this one, but unfortunately all known copies were lost in a 1924 fire at Universal Studios... so it is now considered a "lost film," and only exists as a memory. Curiosities of Indo-European Tradition and Folk-lore, by Walter K. Kelly, 1863 Chapman & Hall, London, England. pg. 242-265. Online: Click here! The "Ensamples" of Fra Filippo: A Study of Mediaeval Siena, by William Heyward, 1901 Enrico Torrini, Siena, Italy. pg. 310. Online: Click here! Phantasmata, Vol. I, by Robert Richard Madden, 1857 T.C. Newby, London, England. pg. 356-357. Online: Click here! Poetical Works of Samuel Butler, Vol. 3, edited by Robert Bell, 1855 John W. Parker and Son, London, England. pg. 46-47. Online: Click here! Supernatural Illusions, Vol. I, by Major P.I. Begbie, 1851 London, England. Pgs. 254-255. Online: Click here! Welsh Folk-Lore, by Rev. Elias Owen, 1877. pg. 234/ Online: Click here! The Werewolf (1913 film), page in the Wikipedia website. Online: Click here!